The Northern Harrier (Circus cyaneus) is a medium-sized, predatory bird in the hawk family. 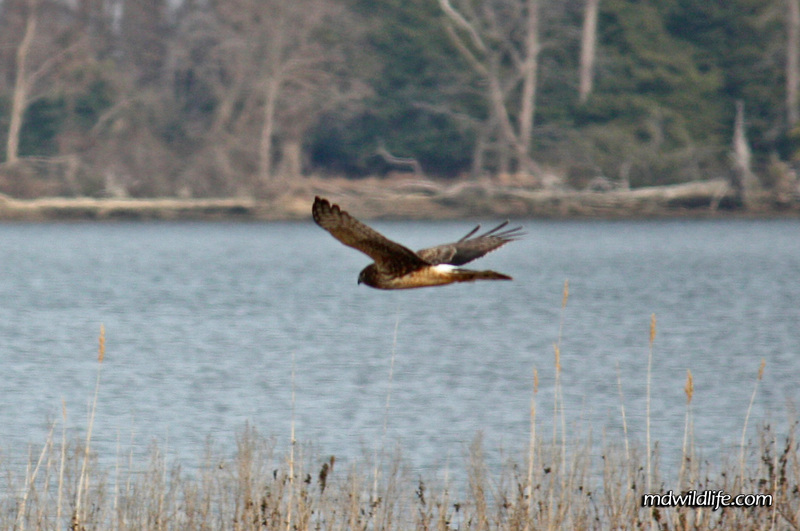 The Northern Harrier can range in all parts of Maryland year round. The one in the photo above was photographed in January at Eastern Neck Island National Refuge. Physically speaking, the harrier has a shorter, stockier head-shape than most hawks, and is almost closer in appearance to an owl from the neck up. The adult male is gray in color, so the image above is either a female or a juvenile. The wings are extended straight out in flight, but perhaps the most identifying characteristic is the plain white section of feathers at the hind region. The white section is clearly visible in the photo. I remember this harrier being a low flyer. I caught a glimpse of him along the main road at the entrance to Eastern Neck and it basically soared low across the meadow and water.